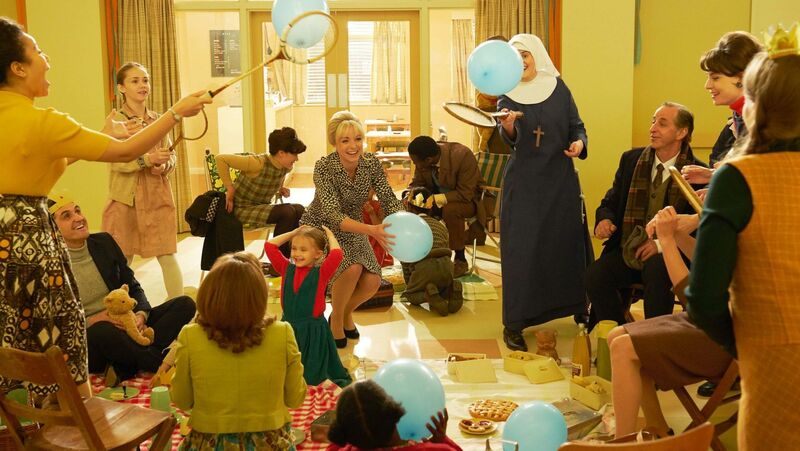 It’s springtime in Poplar when Season 8 of Call the Midwife premieres on Sunday, March 31, opening in March 1964. To deliver you back to this quickly changing world in London, here’s a short recap of events in 1964 that could have been on the minds of midwives and religious sisters. 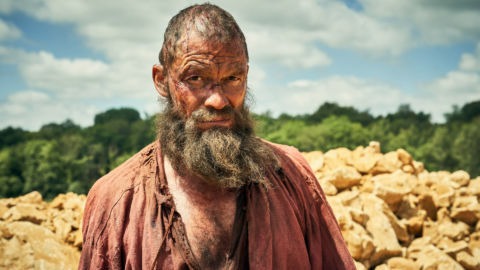 Read our weekly episode recaps here. 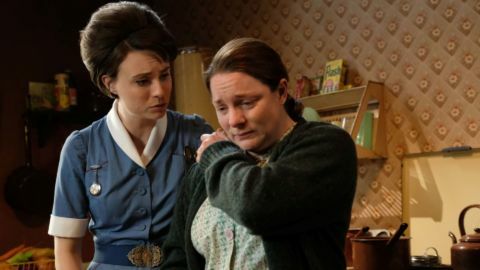 In Call the Midwife Season 8, Episode 1, the birth of the Queen’s baby boy is celebrated. Like everyone else in Great Britain, the midwives are anticipating the birth of Queen Elizabeth II’s fourth child, even if she won’t be availing herself of their services. Prince Edward will arrive on March 10, 1964. Queen Elizabeth’s younger sister, the “rebel princess” Margaret, will give birth to Sarah on May 1, 1964. These award-winning films released in 1964 could have made for a fun girls’ night out for the Nonnatus House residents. 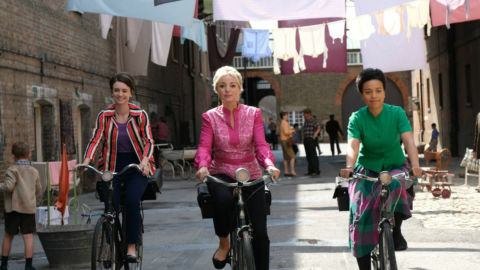 Nurse Valerie Dyer (JENNIFER KIRBY), Nurse Trixie Franklin (HELEN GEORGE), Nurse Lucille Anderson (LEONIE ELLIOTT) in Call the Midwife Season 8. A midwife who worked in London’s East End Maternity Hospital in the early 1960s describes her 12-hour shifts, six days a week, in this interview with the Express. Her service included house calls to impoverished families who lived in conditions similar to Victorian times: no electricity or running water, and vermin! While district nurses and midwives were familiar sights in the United Kingdom in the early 1960s, fewer than 70 nurse-midwives were in practice in the U.S., according to Our Bodies Ourselves. In July 1964, Helen Brook opened the first Brook Advisory Center, which offered unmarried people under 25 advice about contraception and sexual health. Brook’s aim was to reduce the number of illegal abortions and grant women greater equality by reducing unwanted pregnancies and thereby increasing their career opportunities. The organization, now called Brook, serves young people to this day. British chemist Dorothy Crowfoot Hodgkin was awarded the Nobel Prize in Chemistry in 1964 for confirming the molecular structure of vitamin B12, which is vital to red blood cell formation and neurological functions (older persons, vegetarians and vegans are at risk of having B12 deficiency). She developed X-ray crystallography to reveal the structures of biochemical substances, including penicillin. The Labour Party (no relation to the women served by the midwives) takes power in October’s general election in the U.K., ending 13 years of Conservative government. Winston Churchill, who led England as Prime Minister during World War II, retires as a Member of Parliament after 63 years. Britain abolishes the death penalty in November 1964, which will be effective at the end of 1965. To describe the displacement of people in working class London neighborhoods like Notting Hill and Islington, British sociologist Ruth Glass coins the term “gentrification” in her book London: Aspects of Change. Sister Hilda (FENELLA WOOLGAR), Sister Frances (ELLA BRUCCOLERI), Valerie Dyer (JENNIFER KIRBY) in Call the Midwife, Season 8, Episode 2. Two characters we met in the 2018 Holiday Special of Call the Midwife will become recurring characters in Season 8. Plucky Sister Hilda (Fenella Woolgar from Home Fires – Masterpiece) and the saucer-eyed, young postulant Frances (Ella Bruccoleri) move from the Mother House to Nonnatus House. A note for those new to Call the Midwife: Nonnatus House is named for Raymund Nonnatus, the patron saint of pregnant women, midwives, and children. The Nuns of the Order of St. Raymund Nonnatus are part of the Anglican communion, which was founded in 1867 within the Church of England. These sisters are not a part of the Roman Catholic Church, which between 1962 and 1965 was undergoing the revolution of the Second Vatican Council (Vatican II). Pope John XXIII convened bishops and Christian observers in Rome to debate the Catholic Church’s relationship to the modern world. Though not affected by the Roman Catholic Church’s growing pains, Anglican religious sisters probably still took interest in the developments that modernized the Catholic Church’s Mass services and practices. One result was that some Catholic religious orders could trade their habits and robes for everyday, modest clothing. 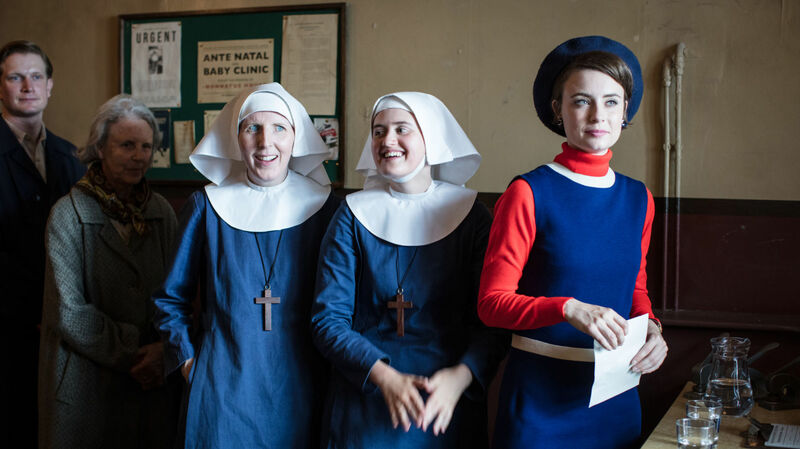 THIRTEEN will recap each of the eight episodes of Call the Midwife Season 8 (find current and past season recaps, here). Join the conversation on social with the hashtag #MidwifePBS.